SUP Safety: PFD's and Leashes, To Wear or Not To Wear? — San Juan SUP Co.
SUP Safety: PFD's and Leashes, To Wear or Not To Wear? Which, what, one, the other, both or none? The question whether or not to wear a PFD or a leash while stand up paddle boarding around Western Colorado and the Four Corners region is one our most frequently asked questions. As with most questions, the answer comes with education. First, we'd like to clear up a common misconception among water recreationalists, the "life jacket." The term "life jacket" is no longer common practice in reference to the floatation devise used to keep your body afloat. The reason for this is, the term "life jacket" relies on the misconception that a "life jacket" WILL save your life. In reality, a "life jacket" is merely there to assist in saving your life. Wearing a "life jacket" in fact, MAY save your life. Because it's not a guaranteed thing, let's stop calling them "life jackets" and stick to the new term, PFD or "Personal Floatation Devise." Sounds more appropriate doesn't it? Do you need to wear a PFD? Unfortunately, the answer sits in a bit of a gray area between regulations and situations. The simplest answer is a matter of educating ourselves about the rules and regulations of stand up paddle boarding. Yes, there are in fact regulations we SUP boarders are required to follow. These can differ from state to state and from one body of water to another. Let's dive in! In 2008, The U.S. Coast Guard deemed stand up paddle boards to be classified as "Vessels." This means that SUPs must follow the same rules and regulations as other boats and watercraft. Let's break it down! 1: There needs to be one PFD per person for each person on board. 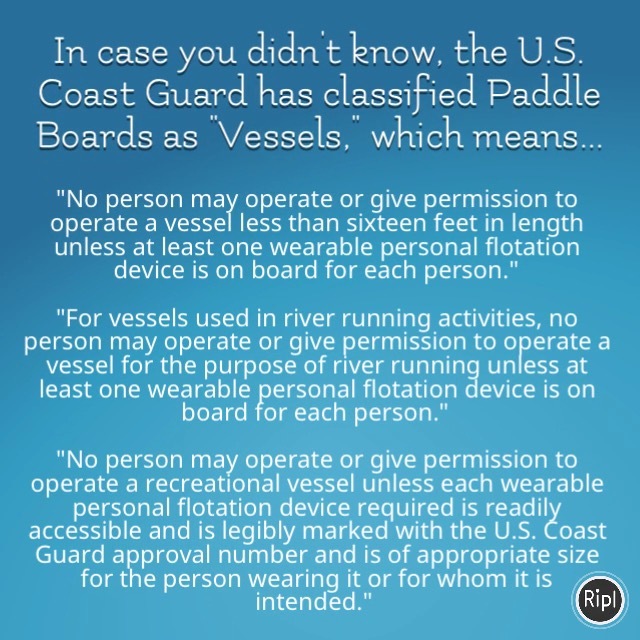 No person may operate or give permission to operate a vessel less than sixteen feet in length unless at least one wearable personal flotation device is on board for each person. Simply put, even if there are two, three, six, eight people on a paddle board, you need to have one PFD per person on board. 2: Children under the age of 13 must wear a PDF at all times. Period! No person shall operate a vessel that has entered the water unless each child under the age of thirteen who is aboard such vessel is wearing a personal flotation device. 3: In regards to running rivers, there needs to be one PFD per person for each person on board. For vessels used in river running activities, no person may operate or give permission to operate a vessel for the purpose of river running unless at least one wearable personal flotation device is on board for each person. Again, you need to have one PFD per person on board. We'll explain why this is even more important on rivers later. 4: In regards to the type of PFD you need to wear, make sure it's right. No person may operate or give permission to operate a recreational vessel unless each wearable personal flotation device required is readily accessible and is legibly marked with the U.S. Coast Guard approval number and is of appropriate size for the person wearing it or for whom it is intended. Basically, a PFD labeled or marked as Type I, II, III, or V (with Type I, II, or III performance) is considered a wearable personal flotation device. Coil combination interchangable quick-release/ankle leash by Hala Gear. Should you wear a leash? Another gray area in which different folks will give you different opinions. Some will say always wear a leash. Some will say never wear a leash. Others will say only wear a leash on a lake and never on a river. Or even, it depends on the lake and river. And what about wearing a leash instead of a PFD or visa versa? How is one supposed to know? We'll make it simple. BTW, for anyone just starting out, this is not where your foot goes. But hey, at least he's wearing a PFD! If it's small enough and you're comfortable knowing you can swim to shore, or it's shallow enough to stand in, we'll leave that decision up to you! If you're not wearing the PFD that is on board with you, wear a leash. We don't care if it's a straight, coil, combo, waist and/or quick-release leash. If you fall off the board, a leash will make it 100x easier for you to get back to your board as well as keep it from getting away from you. We would like to make note that, we err on the side of caution with leashes on rivers. (Leashes should only be worn by those experienced enough to use them and know how break free from them.) A leash can be VERY dangerous in a river as it can act as a trap, becoming wrapped, twisted and entangled, and become caught on river obstacles such as trees, rocks, agricultural fencing, mining materials, strainers and other unseen dangers lurking in our rivers. If a leash becomes entangled, it can pull you underwater and ultimately drown you. Click here to read a scary article from SUP Magazine about a recent ankle leash incident on a river! Here are the situations in which we would suggest wearing a leash on a river. You are experienced with wearing a leash. You have the know how, ability and skills, and have practiced quickly escaping from your leash. River surfing. This comes down to, you know it's a safe place with no unforeseen dangers, and you are very unlikely to get caught on anything. A leash is basically a requirement in keeping your board from rushing off down river when you fall in. It can however, make it harder for you to swim to catch an eddie. If your board ends up taking you with it, you need the skills to be able to release your leash. Lastly, you are very experienced at running whitewater. Again, a leash will keep the board from getting away from you, but it can also become a dangerous hazard and you need the skills to release from your leash and get away. Here are the situations in which we would advise not wearing a leash on a river. You do have a quick-release leash. You are new to rivers and are on a smaller river (such as just about every one of our tributaries) you should not be wearing a leash. You are a strong swimmer, feel safer without a leash, and are comfortable with being able to get to your board or to shore quickly. You are paddling a smaller, lower flowing river that is full of obstacles including rocks, curves, trees, strainers and hidden dangers (the San Miguel and Dolores Rivers). Leashes are not appropriate and can be more dangerous than safe on these smaller rivers. SUP for the Soul shared a detailed story from river-surfer Claire Chappell about the importance of quick-release leashes on rivers. Read her story from here scary experience on the Glenwood surf wave here! This video from the American Canoe Association also helps explain when to wear and when not to wear a leash. So what have we learned? Well, though you are not required to wear a PFD, you are in fact required to have on on board. As far as leashes, again, it depends on the body of water and your experience. We believe that, no matter what, you should ALWAYS wear your PFD while you are on the river. For regulations specific to Colorado, check out the Colorado Boating Statutes and Regulations. If stand up paddle boarders aren't required to wear PFDs, why should you wear one? This is where the gray area comes in to play and there are a ton of questions to help guide your decision. Are you paddling on a pond? A lake? A reservoir? Are you on a river? Is it a flat-water river? Are there rapids, rocks, trees and other dangers? What is the weather? Is it cool, hot and sunny, or will the wind kick up? What is the water temperature? Are you in Colorado where the water runs cold and the weather can change in 5 minutes? Just because you aren't required to wear a PFD, doesn't mean you shouldn't. Let's look at flat-water lakes and reservoirs. The most important thing to remember is, if the PDF is on your board and not on you, it's useless! If you fall off and your board and it gets away from you, not only is it harder to get back to your board, you can become extremely exhausted in the process of getting to it. Add on a small breeze or a stiff wind and your board is gone! Now factor in that cold water and the more time you spend in the water, increasing your risk for hypothermia. To be blunt, if wouldn't take long for you to become exhausted and drown. The truth is, more stand up paddle boarders drown while paddling on flat-water each year because they left their guard down and got on the water without wearing proper safety equipment. Let's look back on this past summer to a paddle board drowning on the Grand Mesa on June 27, 2017, one which could have easily been avoided. The Denver Post referenced a Grand Junction Daily Sentinel report that said Eggleston Lake was still extremely cold. The man "Had a life jacket with him, but wasn’t wearing it." Delta County Sheriff McKee He said. "Friends tried to get him out of the water, but were unsuccessful." We will never know the circumstances of the day, but we do know one thing and that's falling off paddle boards. They tend to shoot away very quickly, and, if you are not a strong swimmer or lack the physical ability to get back up on your board, you'll be swimming for a long, long time. We can say that if this man had worn either a PFD, a leash, or both, he would most likely be alive today. For the story, click here. The reported stated that, when the mother was found, the ring had not been inflated. Read the story here. Again, we will never know the full circumstances surrounding the event or why her inflatable PFD had not been deployed. Perhaps it was lack of experience using the inflatable PFD or the storm was just too intense (we all know how bad those Colorado afternoon summer thunderstorms can be). We can say, that had she been wearing a standard PFD and a leash when the storm kicked up on the reservoir, she would have not gotten separated from her board and would most likely be alive today. Large lakes and reservoirs are tricky. It doesn't take much of a breeze to create large waves and much like paddling on the ocean, the wind and waves can push you across the water very quickly. This video put out by ABC News is a great example (this is on the ocean, but similar situations arise) of what can happen on any large lake or reservoir! All around Colorado and throughout the Four Corners, we have some very large lakes and reservoirs. There can be exceptions from state to state and from one body of water to another as to whether or not you are required to wear a PFD or not. We've heard that in many cases, rules that may will allow substitution in that, if the stand up paddle board operator is tethered (wearing a leash) to their board or vessel, can this be deemed as an alternate or replacement for having a PFD. We have not been able to verify this though. We've also heard stories of paddle boarders getting fined for not wearing PFDs. For instance, coming out of Ridgway State Park, we've heard stories of folks getting fined for not have a PFD on board. Ridgway also requires a sound producing device such as a whistle, another regulation that is required on bodies of water in which motor craft operate. On that note, another rule also states that whenever a person is in the water, "the operator or observer shall display in a clearly visible manner an orange or red flag of a size not less than 12 inches square." Not having a flag on state reservoirs could leave you with a fine as well if you plan on swimming or fall in. We heard stories over the July 4th holiday of folks getting fined for not having PFDs on board while paddling on Trout Lake as well. Colorado Park and Wildlife works extra hard to keep us safe! We witnessed some interesting situations while paddling down the San Miguel River in Telluride this summer. On July 4th, most of the people on the river this day were not wearing PFDs (even though the shops they rented their boards from provided them). Some the paddles which had floaties on them were rentals provided by a local shop. Weird right? Like, what shop would rather save the paddle than your life? We get it, most of these folks were tourists, and how can you make tourists wear their PFDs? Simply, education and making it a requirement! Despite the end-of-runnoff low flows, we ended up stopping to spend some time helping folks around and off this large strainer. Check out this article from The Durango Herald regarding the importance of PFDs on the river. Don't be like these guys. Kayak, canoe, SUP, tube, whatever floats your boat...wear your PFD on the river! All in all, a PFD is the most important piece of equipment you can wear on the water, paddle boarding or not. Our answer to whether or not you should wear a PFD is, "YES! ... In most cases and definitely on the river!" Because, what good is a PFD if it's not on you? Now it's up to you to spread the good word and share this knowledge with your friends and colleagues. Don't sit back a gawk or say nothing. If you see someone going out on a lake or river without a PFD, help them, save them from a fine, or possibly even save their life. Remind them of why they should wear a PFD and help point them to a shop where they can snag one! Here is a list of some of our favorite local shops who are always ready to help! Get on the water, stay safe and have fun!